Art in the Age of the Internet, 1989 to Today examines how the internet has radically changed the field of art, especially in its production, distribution, and reception. The exhibition comprises a broad range of works across a variety of mediums—including painting, performance, photography, sculpture, video, and web-based projects—that all investigate the extensive effects of the internet on artistic practice and contemporary culture. Themes explored in the exhibition include emergent ideas of the body and notions of human enhancement; the internet as a site of both surveillance and resistance; the circulation and control of images and information; possibilities for new subjectivities, communities, and virtual worlds; and new economies of visibility initiated by social media. 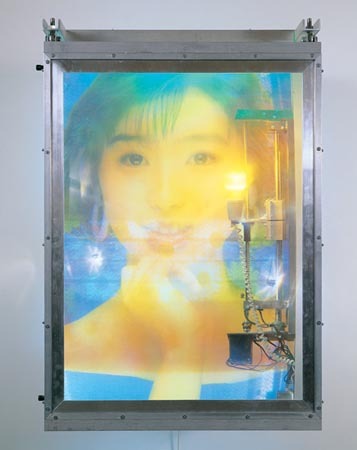 Art in the Age of the Internet features work of an international, intergenerational group of artists, including Judith Barry, Dara Birnbaum, Harun Farocki, Josh Kline, Lynn Hershman Leeson, Trevor Paglen, Nam June Paik, Thomas Ruff, Frances Stark, Hito Steyerl, Martine Syms, and Anicka Yi.